Heat a medium sized frying pan on medium heat. While you’re waiting for the pan to heat up, sift the flour, salt, baking powder and cardamom&sugar mix together into a mixing bowl and make a well in the centre. Add the egg and milk to the well and mix through. Add the coconut oil, the vanilla extract and stir. Fold in the strawberries and coconut. Add half a tablespoon of butter to the frying pan and once melted, ladle out two even tablespoons of the pancake batter to the pan. Spread the batter out to form a neat circle. Once holes appear at the surface of the batter or the bottom is golden, flip the pancake to fry the other side. 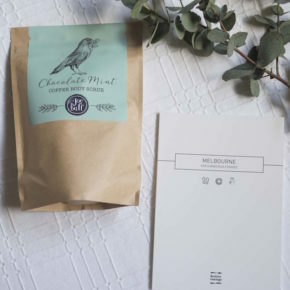 Once cooked through, set aside on a plate with absorbent paper to collect any excess oil. Repeat this process until the batter is finished (and add more butter for frying when needed). Yum! 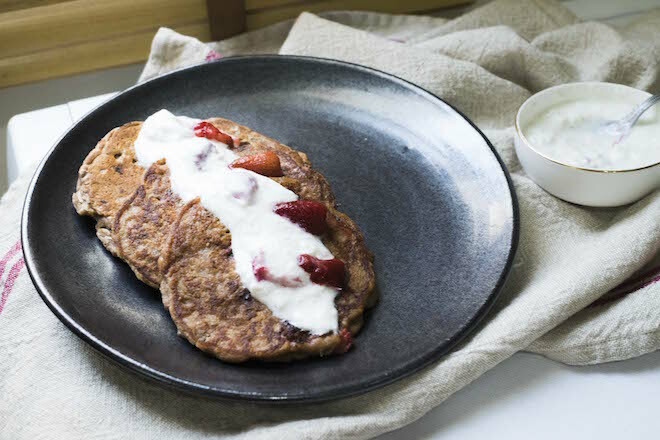 There are many ways to serve the Strawberry and Coconut pancakes – I use 150g of Greek yoghurt with a tablespoon of fine caster sugar and a teaspoon of ground cardamom. I drizzle the yoghurt on top of the pancakes (stacked or fanned out) and dot the yoghurt with chopped strawberries and desiccated coconut. 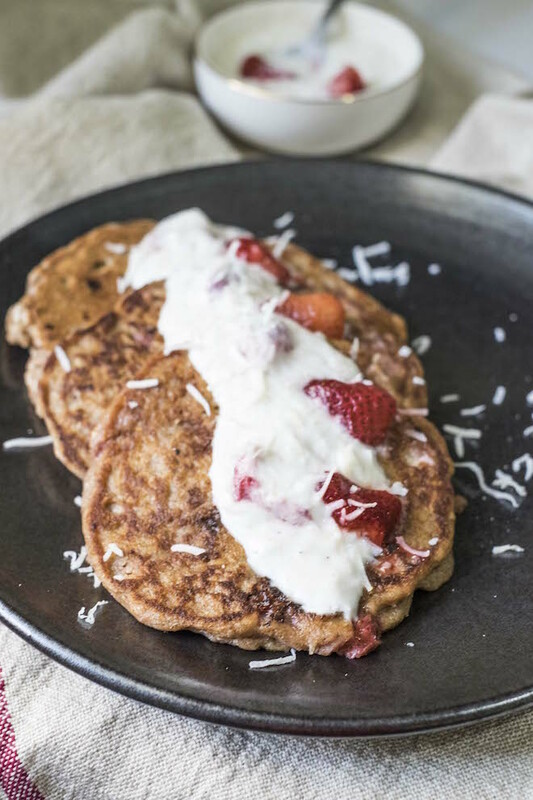 You could simply dust the pancakes with icing sugar and add chopped strawberries or lemon zest, add maple syrup, honey or coconut flower syrup, or add some coconut yogurt and sweet coconut chips.